Add 2 Jewelry Solutions to Cart, Get $0.50 Off each! Earring backs are great. Sharing with granddaughters. I have lost some earring backs so this supply will help me a lot. Happy with them. I'm always losing the back to my earrings. These are a great solution. I hate the little metal backs that come with earrings. I LOVE these. I keep a supply of these as I lose earring backs regularly and need these as replacements. Ever lose the backs to your favorite earrings? Sure you have. Now you have got to find backs that fit. These bullet backs fit every pierced earring I have. And that's a lot. Do yourself a favor and get several packs. You will not regret it. I had looked all over for that kind of earring back, and was very happy to find it in your catalog. I tried a pair and I really liked them. I love these. They don't pinch, you really cannot see them. I have long hair but even when I wear it up. I don't have to worry about loosing my earrings anymore. I will purchase more,as needed. These are great to apply,No losing earrings. ear. They would probably never wear out. to find small items easily in purse. These flexible backs for earrings are great! I use them on wire earrings as well as posts, and because they are soft and flexible, and nearly invisable, they work just fine. Now I don't have to worry about losing one of my favorite earrings! These backings are GREAT! They are so much easier to put on wire earrings than those short thin ones that come with wire earrings. I ordered several packages and need to order more as I have run out due to the fact that I have put them on ALL my wire earrings. Wonderful product. Even when sleeping they are comfortable. I just love these. Good invention. Glad you had them. Tried them first when I saw them in your catalog. 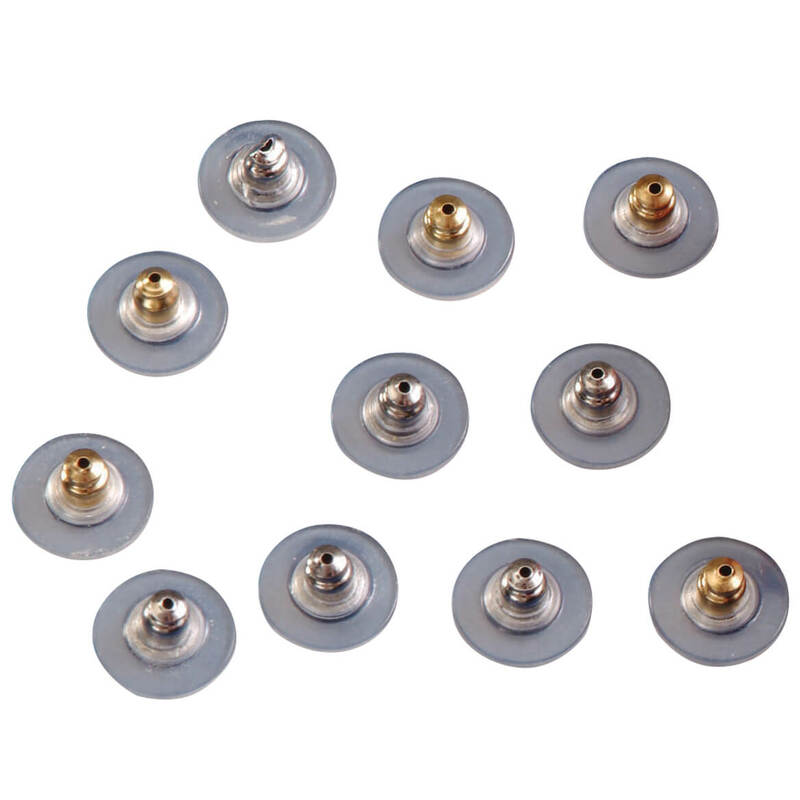 There are two main types of plastic earring backs, these bullet shaped ones and the ones that look like plain hard cylinders. These are superior in every way. They go on to the earring much more easily, are more attractive (practically invisible), and way more comfortable. I use the Clear Bullet Backs for my post earrings that have lost the original backs. Shoot these are great in that I no longer have take backs from my other post earrings if one of a pair is missing it original back. Now all of the post earrings have a back of its own. These are lightweight and easy to use. They don' hurt my ears when I forget to take earrings off t night. I'm fussy about earring backs. I hate the traditional metal backs. These bullets are great, and easy to put onto wire or post. You can not have too many of these. How often can you wear just one earring but the other one has lots it's back to keep it on? This solves the problem. Have a few on hand. Kept losing the regular backing of my earrings. Theses are great, comfortable and don't easily come off when you don't want them to. theses are great. im going to buy a second set. These are wonderful. No more lost earrings. I use this product in two ways: 1. to secure fish hook earrings so they won't (possibly) fall out of my ears and also they can be used on post earrings to secure them. I believe they may be hypoallergenic because I have been wearing one to secure a post earring for probably a few weeks now with absolutely no irritation to my ear lobe. I am keeping a good supply of these in my house because for some reason people who sell the fish hook earrings do not include them! Avoids irritation of the ears due to allergic reactions to metal. Every woman who has ever struggled with earring backs that are either too small or not well made needs these earring backs. I am so happy knowing that this product is well made and strong enough to protect my earrings from getting loose. These backs can take daily use. I now use them on all my earrings. I love them! I highly recommend them. Can now wear all the earrings to which I had lost a back. Arrived on time as described and work fine. I would buty this product again. Very comfortable to back of ears. Can't do without for wire earrings. I have trouble keeping wire earrings in without backs. These are very comfortable and easy to use. I've lost many earrings in the past. These help me keep the earrings on my ears without being seen. Love them! Great replacement part for jewelry. Very satisfactory replacement part for an easily lost part of an earring. I use these plastic backs on both my post earrings and hanging earrings. I love them, I know I won't lose an earring if I use this plastic backs, they are the best! I will probably buy another package sometime soon. I am switching all my earrings to these backs. backs are hard to find when I drop them, these solve the problem of getting frustrated trying to find. I replace the big round plastic discs for the back of my earring posts with these backs, works great when you have multiple holes to adorn!! Great price, deilvered quickly. Always a good idea to have spare earring backs. These fit the bill. Theydoexactlywhatthey are supposed to do! Easy to use, best earring backs ever. We've all tried and dropped the small, finicky backs that come with most earrings and lost them and lost earrings but I don't think I will ever lose any earrings again. These are great and I wish I hard ordered them earlier! Luckily, I've bought two sets, so I am set now for a long while. I really like these backings. They are easy to use , much better than the backings that come with earrings. I don't worry at all about losing my favorite ear rings anymore! stay secure. Will definitely purchase more. Now I can wear all my earrings. These are great! Comfortable And you can barely see them. they are great. They do not irritate your ears and are practically invisible. I like them much better than the metal one because they do not irritate my ears. The earring backs are great because they are inexpensive so when you lose one you don't feel bad. Sometimes it is hard to find them. Bullet backs are the greatest! Most pierced earrings come with a tubular-shaped plastic backing. These are difficult to grasp, easy to lose. The bullet backs are easy to grasp and stay in place on the earring. Have substituted all earring backs with the bullet backs. Highly recommend them! Love these earring backs. They hold the earrings in place SECURELY and COMFORTABLY. I am a senior citizens and these backings are SO EASY to use. Great product. I am always losing or misplacing earring backs so these really come in handy. Also, I am allergic to nickel and these help keep my skin from breaking out. Some of my post earrings are too heavy to sit straight in my ear, so I need something on the back to hold them in tightly. Most of the backs that come with posts are loose and fall off, thus making it possible to loose the earring. I like these because they fit snug. I bought these last month because I am so tired of those metal backs. I am now ordering more for myself and for friends. great product. would buy again. I have a beautiful and expensive pair of diamond stud earrings, bought at [...], but the backs were somewhat flimsy and one day an earring came off at work. Luckily I found the earring itself and searched for more secure earring backs. These clear bullet backs are FANTASTIC ~ they hold my earrings on securely and comfortable and now I can wear them worry-free. And the price was amazingly low for such a quality product. Good job Miles Kimball! A must...to protect post earrings. Use these for backs of earrings so don't loose them. I bought the bullet earring backs and will use them on inexpensive plastic earrings that I currently own. I have only used one pair so far so I will keep the other earring backs for the future. I have purchased these before. I have often lost the back of earrings and these are a great replacement plus finding gold backing for earring is difficult. These work on any one of my Earrings...purpose is to keep them from falling off since I have lots of fishhook ERs! Comfortable and holds earring securely. I always feel secure when I have these little backs added to my earrings! So happy to have found these earring backs. I am so sick of losing earrings I love. I made a promise to me, to never wear another pair of earrings without this back. Ease and comfort all the way. Love this item. These are great. I am not able to wear any kinds of earring backs that are the metal kind even if they are real gold. These are great and they feel like they are made out some type of gel. You cant even tell you have them on at all. I really like them a lot. Always find what I need! I looked for these everywhere found them here. Have many ear pearcings these work well. I use this as pictured and also on earrings that don't need backs to hold them in place. I have crystal earrings that I love but could not wear bec the back kept slipping off. these bullet backs are nice and tight. Very useful product, I not only use them for my earrings, I use them for my brooche back. These are the only backs for earrings that I use. They work well with all my earrings. I love them. They don't pinch. The ones I've used have fit perfectly. I like to have extra backings because I drop them and can't find them. I have used these earring backs on a couple pairs of my earrings that are plastic and more casual wear. I also bought an extra pack of these earring backs for when I use up the first pack of earring backs I bought. On earrings that need something different Hole is good for some earrings & small for others. Have ordered these before & they're wonderful !! I plan to give some to my daughter . I have about 20 earrings that don't have a partner. I will never lose a single earring again. Great product. Even with my arthritic hands, they are easy to use. This is the third time I've order these. They are a good price, and I know they are in stock. Love these backs. Work great. Wanted to replace screw on backs. These work perfectly. Will order again if needed. They are very comfortable to sleep in.Also they are tight fitting. They stay on while swimming.Very inexpensive and I have searched all over for these. I love these amazing little things. They grip the posts of your earrings securely without slipping as normal backs do. They are perfect to secure those keepsake earrings you are afraid to wear for fear of losing them. GLAD I TRIED THEM. VERY COMFORTABLE ON THE EARS. I ordered these because I am allergic to nickel, so now I don't have to worry about the back of my ears becoming irritated. They are easy to use and don't let go of the earring. Been using these for a while. Don't lose my earrings anymore. They need to be replaced after multiple use as the plastic yellows and hardens. I use this product as backs for my pierced earrings. I love this product that works perfectly for me as they do not hurt the back of my earlobes when used. Great for replacing lost or loose backs or ones that are not comfortable. I bought these to replace lost earring backs. I was hoping these would be snug and not as easily lost. I also thought the size would be easier to handle and they were. 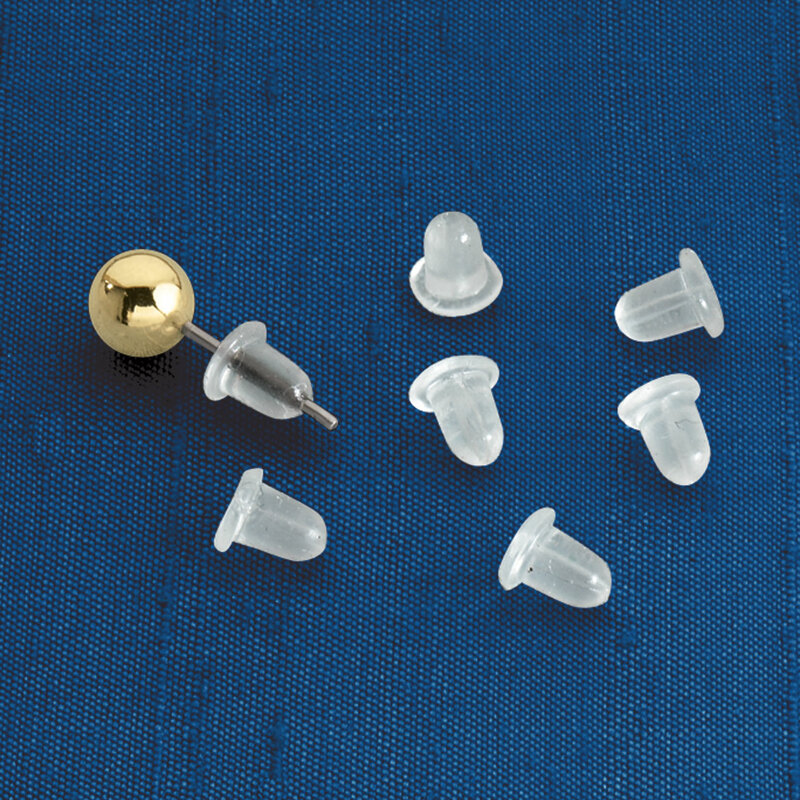 I use these earring back instead of the plain cylindrical ones as the knob makes them easier for me to grasp. I use them on my French wires as well as the regular pierced earrings. Since they are clear, they don't really show much. I am a repeat customer. Love them! Easy to hold, put on and take off! I use it to keep fishhook earrings from falling out of my holes. As stated above, I have lost so many shepherd hook earrings as they rub on coats and high neck sweaters. You need these backs to keep the earring from pushing up and out of your ear. Regular round hard plastic earring backs are so hard to get on and push them up to your ear, that I've bent the earring hooks. Metal backs tend to get lost and are hard to grab, these don't do eiher of these. They hold tighter than metal backs. These are great earring backs. I purchased these backs due to the size which was a little longer than most. The are easier to hold when putting them on my earrings. This was the second time I purchased these backs & will probably order more in the future. They work well as replacements for those itty bitty cheap backings. I love these because if I use the gold or silver backing at night I get poked in the head so I use these and I don't get poked. They are also good to use on back of pins where pin clasps don't always work. These are great, I have almost lost my diamond studs a couple times, with these backs I am never going to worry about that again. Only drawback is they are a little tight at first, which I guess is very good. No more sharp pinches behind the ear! Comfort from the sharp pinches of ordinary earing backs. These are so soft, you may forget you are wearing earings, and sleep with them. No problem. They're soft, safe and secure. A tiny solution to a "piercing" problem. Good but a bit too big. affectionate person. I attend church faithfully and do quite a bit of hugging others. Because of the earrings with straight backs, I would too often, end up with a bleeding puncture wound in my head, behind my ear, after hugging someone. My husband knew I enjoyed hugging others and I preferred to not stop wearing earrings. We thought these earring backs may be the answer. Although they didn't eliminate all the pain, they do make sharing affection less painful and more enjoyable. I have many pairs of earrings and I am always losing the backs. These were good replacement backs. I should have ordered more. I don't have to worry about loosing my diamond studs that I wear everyday in the top of the 2nd peircing in each ear. All products received where fine. I would order again. I don't have to worry about losing an earring. And these are easy to handle and quick to put on. Some of these earring backs did not fit my earrings. Many of my post earings could not go through the holes without trying to enlarge the holes. Too small to use on hat pins. Also difficult to maneuver (my hands too big?) Perfect for earrings, but I would have the same problem with the delicate backs. These were smaller than I expected. Also it is a little hard to put on the earings. They slid off of my earrings twice in one day. By the grace of God I was able to find my earring, TWICE. Never again will I use these backings. The backs do not fit 99 1/100% of the earrings I have. I wish I had known that before I ordered. Ear backs are to large and you see them on your ears. They take away from your earrings. Keeps earrings on without them being lost. I am always losing the backs to my earrings. I have almost run out of the stash that I have. They work great. Just be sure to put them back on the earrings after taking them off or you will lose them as I do. I keep losing these items. Same as before. I have saved your catalogue just so I could order these as no one else seems to have them. I have long hair & it gets caught up in my earrings & pulls them out. I've lost some of my favorite earrings this way. But, I do hope the opening in these earring backs aren't too wide & the wires of my earning don't slip out & it keeps them in place, so I won't keep loosing my earrings. I have earrings without these and they tend to fall out so with these to stop them, they will stay in my ears. These are easier to use than the barrel ones. Who doesn't need more earring backs! Very handy to have around. Great stocking stuffer. THEY'RE HANDY TO HAVE AROUND. I am always losing the earring backs. These are the best earring backs! Have some already--needed more. these are great, no more lost errings. I keep losing the backs to my post earrings. I am on the phone a lot at work and I can't wear my post earrings, I'm hoping this will let me wear my post earrings without hurting when I am on the phone. My mother said that this type of back is the only one she can hold and get her earrings on with. Wanted them for my post earrings. can't find anyplace but here. I am always in need of earring backs. Regular earring backs cause problems and make my ears itch. Easier to handle than standard earring backs, pinch less, too. Have used this type and find them easy to apply to earring back. Prefer this type of earring back and hard to find in stores. I have purchased these several times already. They are great for making sure that your fish hook earrings are secure and they also work great on post earrings. Have never lost an earring when I have used these and I find these particular ones to be the best size and quality, others may be less expensive but these are worth the cost and also the size makes them easy for my older hands to handle. Need earring backs for easier application. 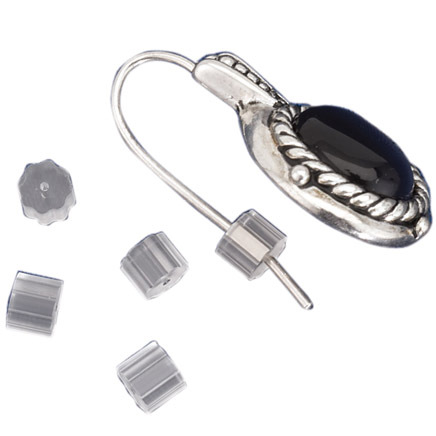 Comfort clutch earring backs ensure that big earrings won’t droop. Clutch earring backs keep the weightiest pair upright. Cushion ears and prevent holes from enlarging. Set of 36 has clear 1/2 discs with silvertone and goldtone backs. Rubber earring backs secure earrings. With these earring backs you wonu0027t risk losing precious earrings! Cushion wire clutches slides onto wire backs to prevent earrings from slipping out of your ear. Set includes 12 pieces.